A powerful steam jet of 150 g/min can smooth even stubborn creases on dense fabrics. The iron has a scratch-resistant ceramic soleplate. If you use the steam option continuously, the iron will cool down quickly. 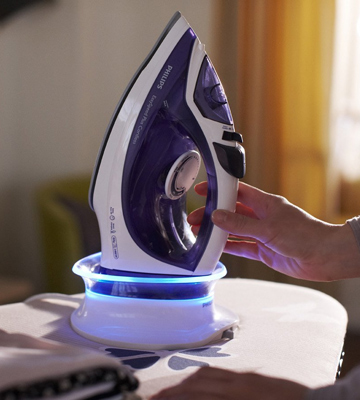 It's a reliable and effective steam iron with a smart base and smart light feedback. The light indicator will always keep you informed of the status of the iron. 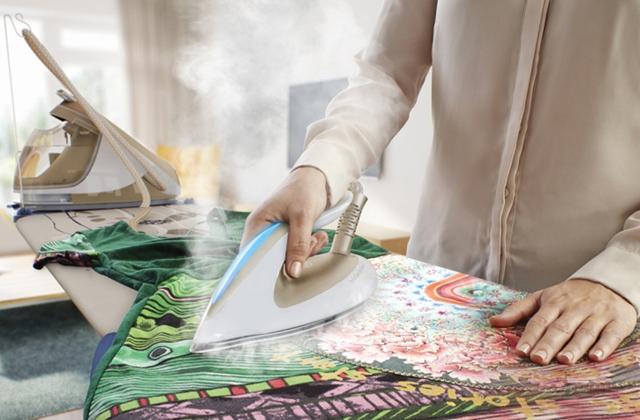 The iron can steam vertically or produce a fine mist to moisten a fabric a little. 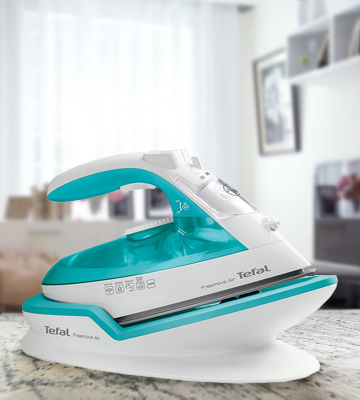 This Tefal cordless iron has an ergonomically-designed, horizontal base to match your natural movement as you iron. You can slide the iron into place without lifting it. The re-charge takes as many as 11 seconds. The Tefal free move cordless steam iron is an easy-to-use appliance with smart light indicator and comfortable ergonomic handle. It slides into its horizontal base without lifting to ensure the ultimate comfort for users. Although the Russell Hobbs 23300 steam iron features a large water tank, it warms up in just 5 seconds and can work for 25-30 seconds afterwards. The iron is a little wobbly on the charging base. Once you get used to the way this Russell Hobbs iron works, you'll get the freedom of a cordless and consistent heat. It's a simple yet efficient appliance for small jobs. You will be able to iron clothes without frequent refills and the cord getting in your way. This model features a fairly large water tank (370 ml) and, thus, it can produce continuous steam at a speed of 48 g/min to make steaming as efficient as possible. When it's full, it's a bit heavy. 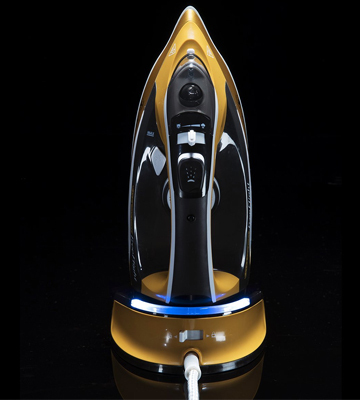 The JML Phoenix Gold FreeFlight cordless iron is an extremely powerful appliance for tackling even the most stubborn creases. It has a classy golden design that will blend beautifully into any interior. It can also work as a corded iron. The CeraGlide multi-layered Ceramic soleplate ensures ultra smooth and easy glide on any type of fabrics for a silky finish. The water tank is too dark, so seeing the water level is difficult. The iron is much cheaper compared to other big names but can even outperform some of them. It can be used either corded or cordless, meaning it's a good choice for those who often deal with mountains of laundry. 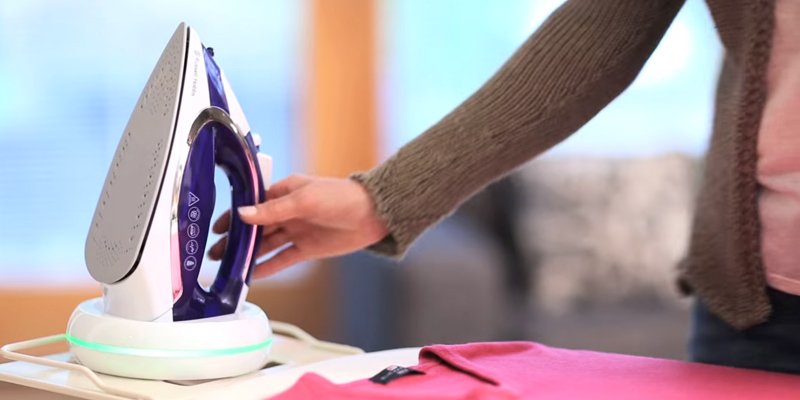 The Philips 23300 Freedom Cordless Steam Iron is powerful enough to tackle heavy-creased items. With 2400 W, the iron starts up extremely fast and produces a strong jet of steam to plough through the crumpled laundry (35g/min continuous steam). Also, it boasts powerful steam boost performance of 150 g. The water tank capacity is 270 ml, and you can fill the iron with tap water or buy special iron water if the water in your region is too hard. The filler cap conveniently pushes over so that you can refill the iron right from the tap. This Philips cordless iron can be used to steam vertically in order to remove stubborn wrinkles from your curtains or some hanging garments such as jackets or long dresses. And the cordless design means that you have a total freedom of movement. No cable will catch on your laundry or get snagged somewhere. The iron has a ceramic soleplate that is very durable, smooth, and effective. It easily glides on all types of fabric. If needed, you can use the spray function to moisten the fabric a bit. It will make it easier to iron out creases, so you won't need to iron the same areas again and again to de-wrinkle your clothes. The appliance has a handy control dial for varying the temperature according to the fabrics you are ironing. The baseplate is very smooth and easy to manoeuvre. It resists scorching and, thus, it's very easy to clean. The iron itself (without the charging base) weighs 990g, meaning it's light enough not to cause hand fatigue but heavy enough to do the job. Compact, comfortable, and super effective. The Philips cordless iron comes with a smart charging base that is pretty compact and takes up little space. The iron easily locks onto the base for convenient storage and transportation. The base has a long 1.9-meter power card that can be wrapped around the heel rest of the base. The iron needs to be put back on the base every 25-30 seconds and it can be fully charged up in 6 seconds only. During this time, you can arrange your garments, for example. After that, you're ready to go again. The Philips steam Iron needs re-charging once the base unit turns yellow. 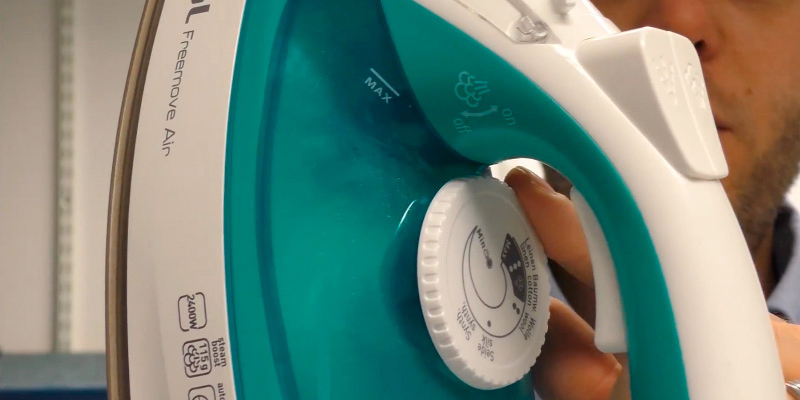 When it flashes blue, this means that the iron is charging, and as soon as it's solid blue, you can remove the iron. 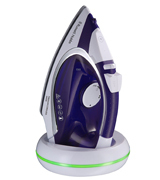 Solid blue light indicates that the iron is fully charged. 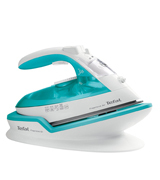 The Tefal FV6520 is an ultra-manoeuvrable steam iron that will bring ironing to the whole new level. It uses a super-smooth ceramic soleplate that glides effortlessly over your garments, leaving them crease-free. With 2400W and 250-ml water tank, it can produce long-lasting steam. Depending on your ironing needs, you can choose a continuous steam flow at 25 g/min rate or a steam boost option at 115 g/min rate. You just need to use an ergonomic steam trigger on the handle right under your fingers to choose the required steam jet. 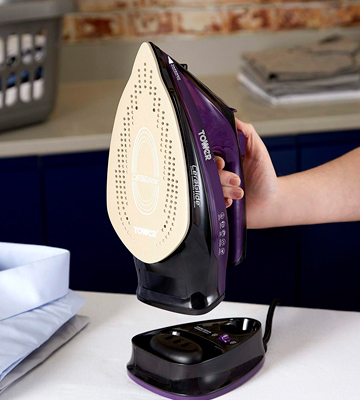 We would like to point out that you can also use this iron as a vertical steamer to de-wrinkle delicate fabrics like silk and others. Steaming will be fast and effective due to the numerous steam holes located on the tip, sides, and centre of the soleplate. In addition to great performance, the Freemove FV6520G0 can please you with its usability. 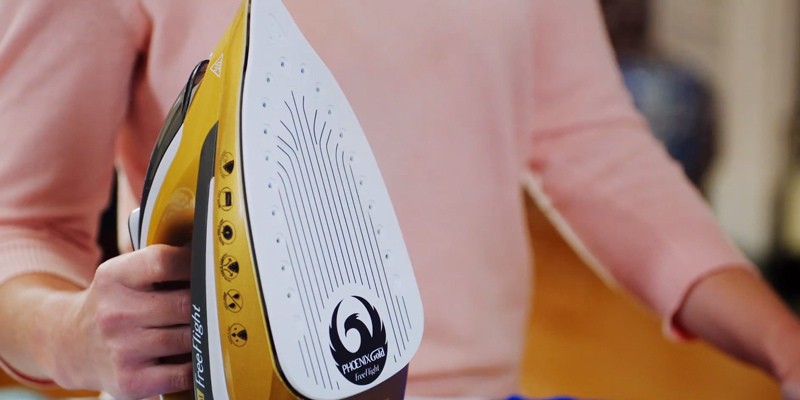 In just 11 seconds after you set the iron on its base to reposition your garments, you can take it and iron for 25 seconds. A built-in light will inform you when exactly it’s time for a top up. Thus, you'll never run out of power during ironing. However, the best part about the base is that it has an ergonomic design. The base is horizontal to match your natural movement. This way, you can put or take the iron even without lifting it - simply slide it into place. 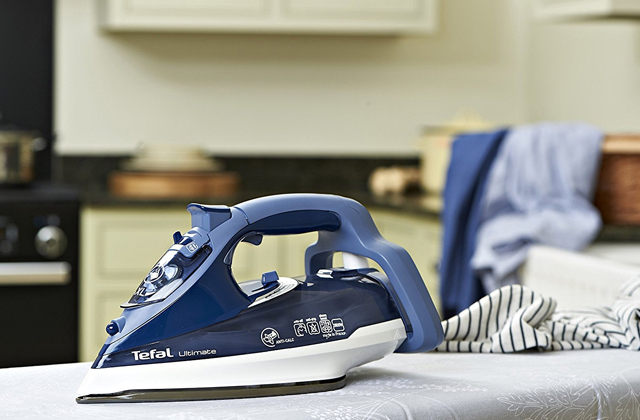 This Tefal cordless iron can really make clothes refreshing quick, safe, and hassle-free. 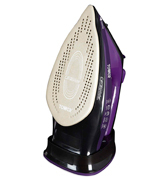 The iron features an auto shut-off function that adds to the safety of use drastically. With this option, you can have a total peace of mind if you ever forget to turn the iron off. The iron will shut off automatically if left unattended on the base for more than 8 minutes. To restart, simply remove it from the base and then replace it to charge. A built-in anti-scale system is another bonus that simplifies the maintenance of the iron. Because of the tap water, the limescale accumulates over some time and can even lead to malfunction of the iron. However, with the scale collector, you’ll get rid of any build-up easily. Finally, we would like to say a few words about its anti-drip feature. 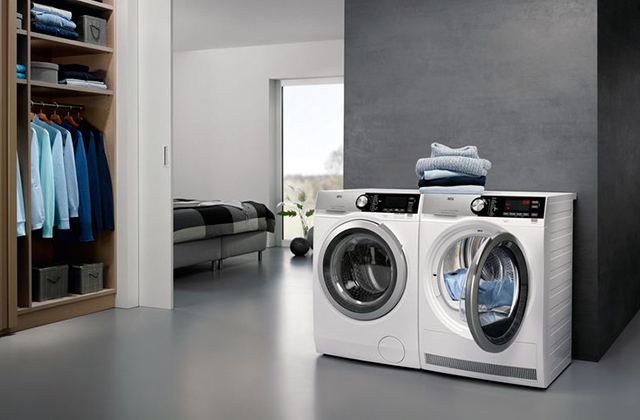 The double anti-drip system prevents the iron from leakage, thus, not only ensuring the proper operation of the appliance but also preventing the appearance of wet spots on your freshly-washed clothes. 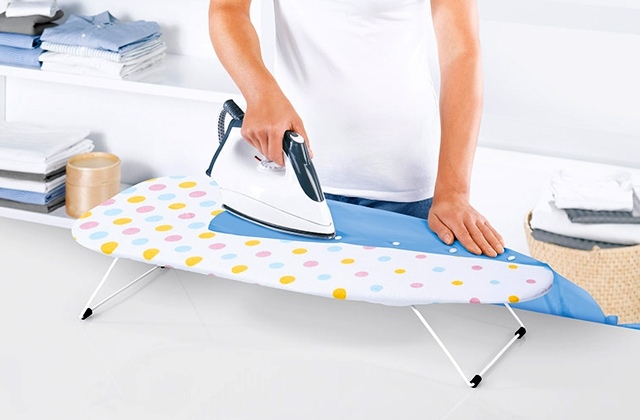 If you have a large ironing board and can't find an iron with a long flex, the Russell Hobbs 23300 can give you a freedom of a cordless and consistent heat. It's an affordable, simple-to-use, visually attractive, and very sturdy cordless iron. It offers good steam performance for its size. The appliance is quick to set up and use. Just fill the iron with water, choose the desired temperature using controls and dials, plug in the base unit to the mains, and put the iron on the base. When the iron charges, the light on the base will instantly glow red. As soon as it changes to a flashing green, the iron is ready for use. It has a super-fast heat-up (just 30 seconds). And you get around 20-30 seconds of ironing time before the base unit flashes red again. When it cools down a bit and needs to be put back on the base, you'll hear a beeping sound. It requires five seconds for re-charging. 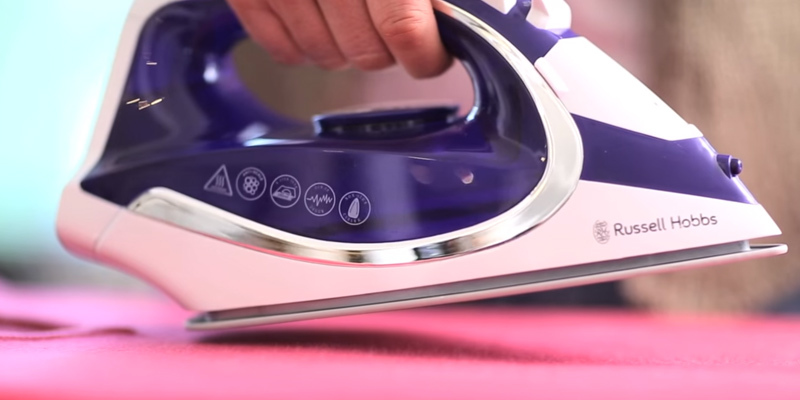 The Russell Hobbs cordless iron allows you to select the optimum setting for the fabric you’re ironing. It has 3 power settings - the first is good for nylon, polyester etc, the second one deals with wool, and the third is for cotton and linen. If you need to target tough creases in linen, canvas, or denim, the iron can deliver an extra-powerful 135 g burst of steam. And if you need to tackle creases in such fabrics as cotton or silk, you can choose the 40 g/min continuous shot of steam. Also, it allows you to vertically steam curtains at the max setting. 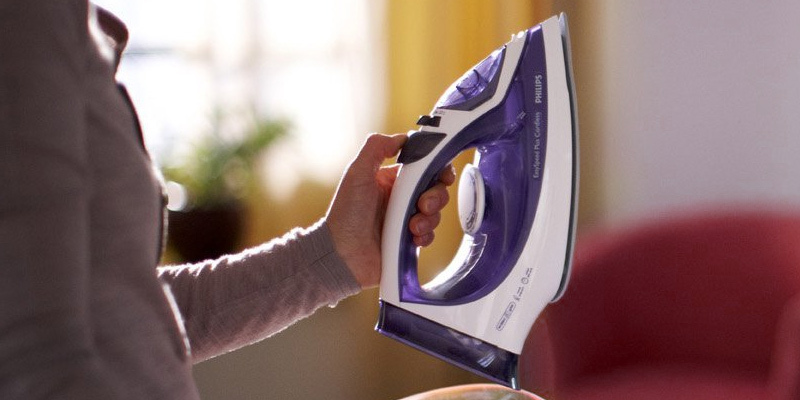 Since the iron is cordless, it's suitable for right or left-handed use. It's a solid mid-sized iron that is not too heavy to hold. The ceramic soleplate is excellent. It glides smoothly through those tricky creases without snagging. If the Russell Hobbs 23300 is inactive for more than 8 minutes, it switches itself off automatically. What we really liked about this Russell Hobbs cordless iron is that it has a large 300-ml water tank. It doesn't need refilling very often. Moreover, the reservoir is fully transparent so that you can always know when it’s time to add some water. The package doesn't include a filling jug, however, the water tank is well positioned and easy to fill. 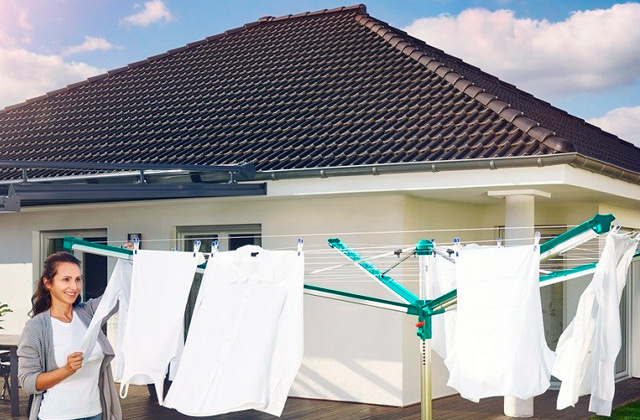 The iron features an anti-drip function to protect your clothes from nasty water drop stains. 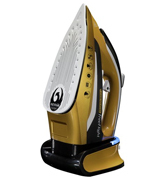 The Phoenix Gold FreeFlight Cordless Iron is another premium product by JML. It looks terrific and works terrific! The luxurious gold body with black detailing hides superior functionality inside. First of all, we would like to mention its super-quick heat-up time. 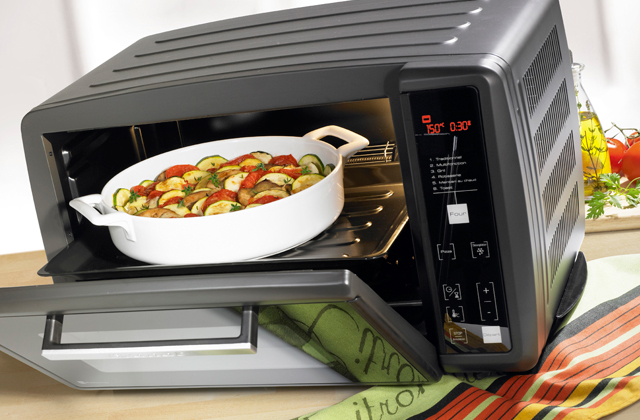 The initial charge takes only 30 seconds, while the reheat time makes 6 seconds. However, if 6 seconds is too long, you can attach the iron to the dock and use it non-stop for continuous steam output. Equipped with a large water tank, the iron can produce 48g/min of sequential steam. Also, it doubles as a vertical steamer to refresh delicate garments on hangers. You can choose Steam burst (a shot of intense steam) for removing even the most stubborn creases. Like most high-end irons, this one features a ceramic-coated soleplate that smoothly glides across clothing without sticking or snagging. Plus, the soleplate boasts a precision tip enabling you to reach those hard-to-get areas around buttons or between pleats. 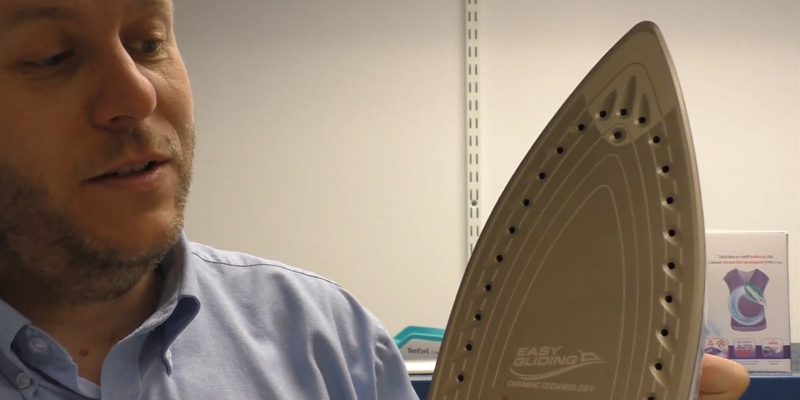 If you prefer to iron at low temperatures, you'll benefit from a drip-stop function. The iron will automatically stop steaming when the temperature is too low in order to prevent water droplets from dripping of the soleplate. To prolong the life of the iron, the manufacturer has fitted it with a permanent anti-calc filter that softens the water to prevent limescale build-up. Also, the appliance has a self-clean function that simplifies its maintenance significantly. For your peace of mind, there’s even an auto-off safety setting that switches the iron off automatically if you happen to forget to do this. 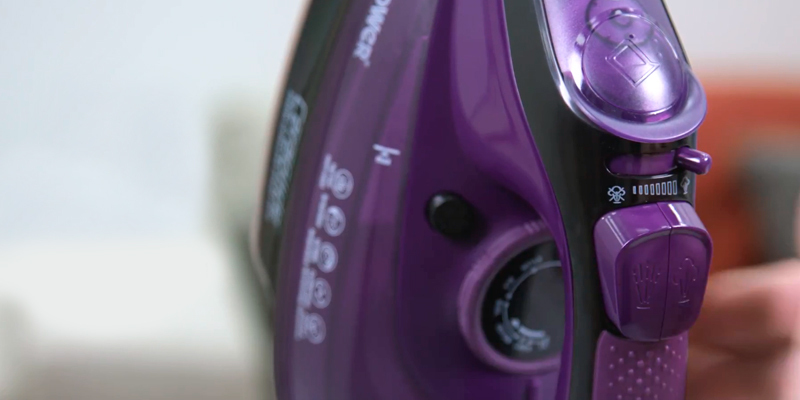 This sleek-looking iron is one of the most effective cordless irons out there! The secret of its success lies in its continuous steam output of incredible 48g/min. This powerful steam is determined by an extra-large 370-ml water tank. Not many other irons on the market can boast of the capacity like this. Of course, the iron feels a little heavy when full but still it's not too heavy to cause arm fatigue. Although the water tank is not transparent and has no water spray, it's very easy to fill and empty. Tower is the iconic British-owned company that boasts over 100 years of experience. It brings an exciting, expanded range of household items to make the life of British families much easier. And for sure, its T22008 cordless steam iron can become a welcome addition to any home. It's much cheaper than irons from well-known brands names but it can even outperform some of them. 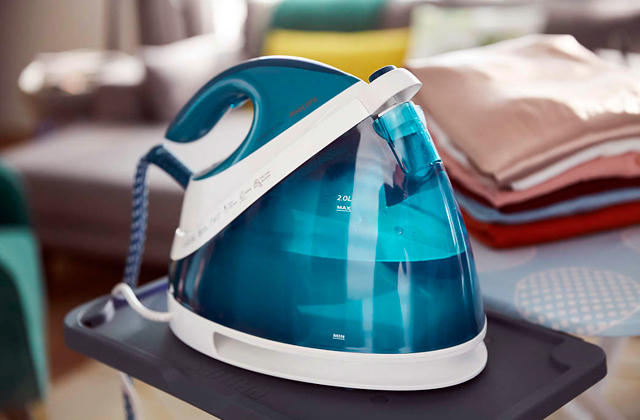 With 2400W of power, the iron heats up in mere 30 seconds for quick and effective laundry care. Once the unit is ready, you can choose 120g/minute steam output for basic ironing or 150g/minute steam shot for stubborn creases. It's designed with a nano-coated CeraGlide ceramic soleplate, thus, it's suitable for all fabrics. The soleplate has a nice glide, and the ultra-thin taper at the top makes it easy to iron small details. 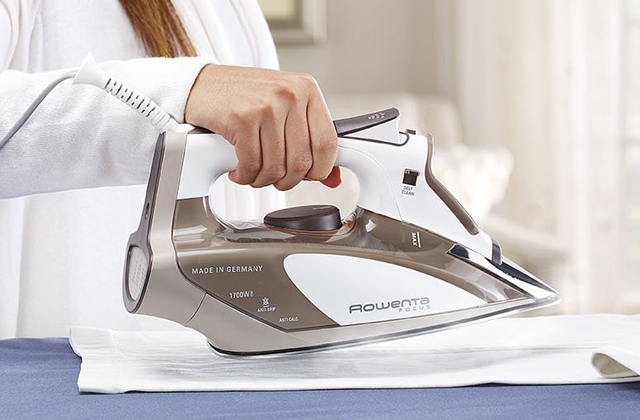 The iron gives a smooth, silky finish to everything from delicate garments to bed sheets. The item itself is hefty enough to give a good press yet it's very comfortable to use. If you want, you can steam hanging garments vertically. The Tower T22008 cordless iron is equipped with anti-drip, anti-calc, and self-cleaning functions, which allows for easy maintenance. Also, it comes with a water measuring cup for extra convenience - adding the correct amount of water is very simple. You can fill it up with the tap water with no worries about lime-scale build-up. Perhaps the only thing worth improvement is the water tank. The plastic on the tank is too dark, so seeing the water level might be difficult. Like other cordless irons, this one has a base unit that attaches to the power source. 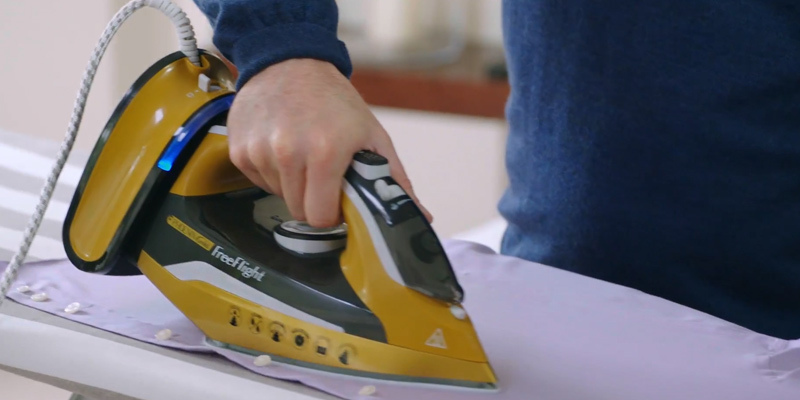 The iron slots into the base unit to be heated -after 30 seconds, the iron can run for a few minutes without recharging. However, agree that there are times when you wish you wouldn't need to place the iron on its base that frequently. Luckily, you can use this iron corded and cordless. 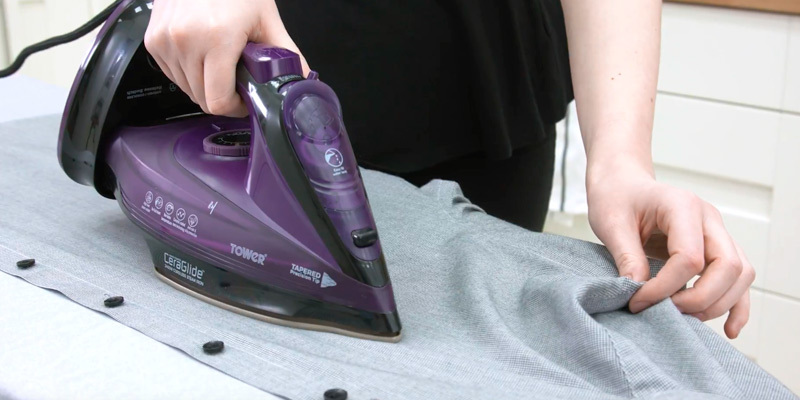 If you need to iron large items, you can simply lock the base unit onto the body of the iron and go. 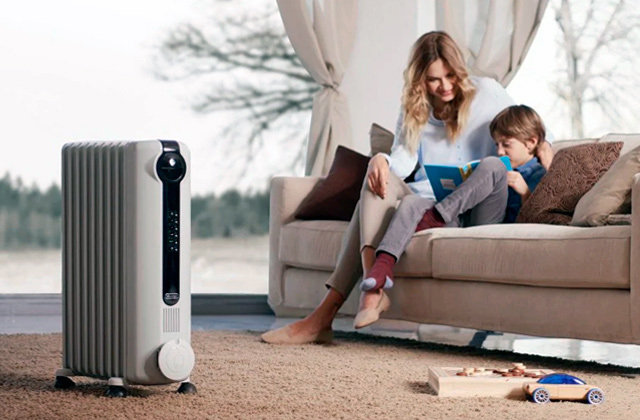 The base unit is remarkably slim and light, so you won't feel fatigue in your arms. And the cord of the iron is long enough to provide you with freedom of movement. After use, you can neatly wrap the cord around the base for easy storage. Simple, effective, and smart, this iron can be a great choice for those who often tackle mountains of laundry. What Is a Cordless Iron? As it's easy to guess from the name, a cordless iron is the type of iron that comes without a cord. 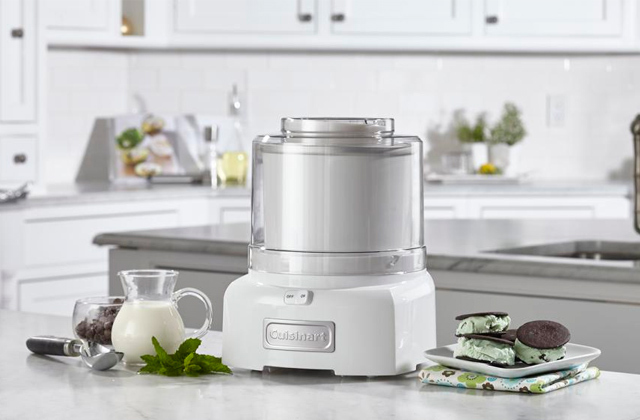 Cordless appliances gain their momentum today entering all spheres of our life swiftly and confidently. Which isn't surprising considering how much easier and more convenient they are to use compared with corded models. Same with an iron. A wireless iron can give you the freedom of movement and no more tangling cords will complicate the ironing or cause new wrinkles on your freshly pressed clothes. Cordless irons consist of an iron and a charging base. 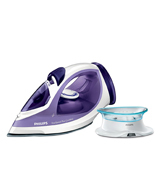 The iron comes fitted with a rechargeable battery that feeds from the charging unit in seconds. The majority of irons have light indicators which notify when the iron is hot enough to start ironing. When you finish ironing, a charging station goes unplugged and can serve as a storage space for the iron. Speaking of the functionality, cordless irons aren't much different from the corded models. You can find irons with/without a steam option, adjustable temperature settings, auto shut-off option, etc. Same with the power. Though without a cord, cordless models do not lack in power and some of them may even outrival corded irons. If you enjoy the usability of cordless home appliances, you might also be interested in cordless vacuums that can greatly ease your everyday cleaning routine. While if you're a homey kind of person who prefers home-made food and cooking at home, we'd like to recommend you to take a look at this selection of wonderful cookware sets. As a rule, when you’re looking for an electric home appliance, power is the first characteristic that should be taken into consideration, and wireless irons aren’t an exception. The more powerful your appliance is, the higher temperatures it can produce. So before deciding on the power of an iron you’re going to buy, think what fabrics prevail in your wardrobe. If you mainly need to iron nylon, polyester, or silk, a 1200-Watt iron will be enough to handle this task. If your clothes are made from various fabrics – from thin wool to thick cotton – you’ll probably want to consider an iron with the higher power. Stainless steel soleplates are the most common ones used in iron production. The beauty of this material is its durability. The material is also considered as non-stick and glides over fabrics effortlessly. Plus, it is very easy to clean. Ceramic soleplates aren’t made entirely of this material, only coating of a soleplate is ceramic. But it’s enough to provide even heat distribution and reduce static. Aluminium is a lightweight material that conducts heat fast and evenly. One more benefit of aluminium is that it costs less than other soleplate materials. However, keep in mind that every material has its disadvantages, too. So they should also be taken into account before you make a choice. Water tank capacity and weight determine how convenient it will be for you to use the iron. If you don’t want to bother with water refill often, look for a model with larger water reservoir capacity. It will also be great if a water tank is transparent so that it is easy for you to determine when it’s time to add water. Pay attention to refill opening that should be large enough for effortless water pouring. And if there is a special measuring cup in the box, this process will be no hassle at all. As for the weight of a cordless iron, it’s obvious that the lighter it is, the easier it will be for you to handle it. Please note that the weight of a cordless iron is indicated with the weight of a charging base. There are also other features that ensure the convenience of use of your cordless iron. Thus, a cord winder or retractable cord will make its storage more compact. 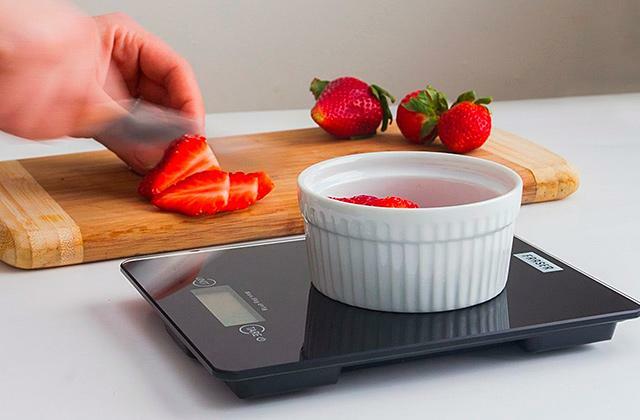 A scale collector simplifies iron cleaning when it comes to removing calc. And auto shut-off provides not only convenience but also the safety of use of your electric appliance. Throughout their history, clothing irons were made of different materials. The very first prototypes of irons appeared long ago. They were made of different materials and in different shapes. Here are several examples of how our ancestors tried to do the ironing. - One of the ways to remove wrinkles from clothes was beating it. In Rome, for example, people used a metal paddle to handle this task. - The next step to improve ironing was the usage of a handle mangle or a prelum. These tools were made of wood and allowed treating a larger surface of fabric in one go. - One more invention used to press wrinkly clothes was a pan iron. Its shape resembled a modern pan we use to cook pancakes. It was filled with hot sand or stones and moved over clothes to remove creases with the combination of heat and press. - The first electric iron was invented in 1882. It was heavy and it took long time to heat up. Luckily, modern irons are lightweight, functional, and convenient to use, and cordless irons are great examples. Ironing is beneficial both for your clothes and for you. Perhaps, the first and foremost reason why people do the ironing is the desire to look neat and attractive in freshly pressed clothes. Admit, a person wearing ironed clothes makes a more pleasant impression than the one in a shirt with wrinkles. One more advantage of ironing is that it kills germs. High temperatures are able to destroy bacterium so after ironing, you wear neat as well as sterile clothes. Treating clothes with heat in order to remove germs is especially important when it comes to taking care of baby’s clothes. Finally, some people claim that ironing is relaxing. In addition to being an effortless process thanks to modern technologies like steam or cordless ironing, it also allows you to mix business with pleasure. Listen to your favourite music or watch an interesting film while doing the ironing and you won’t notice how soon you’ll get a pile of freshly pressed clothes. An iron has several more uses you might not know about. 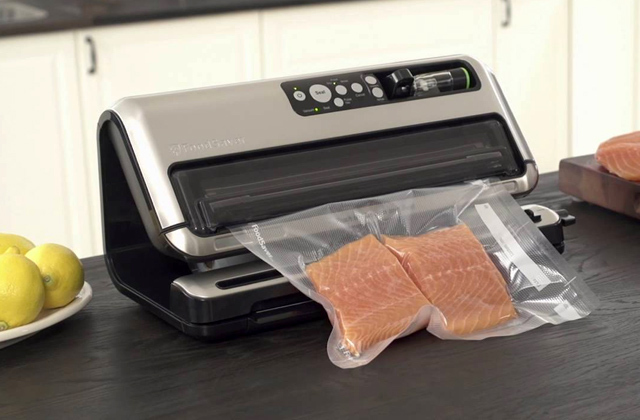 - Use iron instead of a laminator. If you need to laminate a document, certificate, or another important paper, there’s no need to buy a special machine. All you need to seal up a piece of paper is a couple of laminating sheets, a towel, and your wireless iron at hand. Place s document into plastic sheets, cover it with the towel and iron it for 30-40 seconds. Then, flip your document and iron another side. If you haven’t done this before, you’d want to try to laminate a simple sheet of paper first in order not to spoil an important document. - If wax from a candle spotted the surface of your desk or another wooden surface, an iron will help you remove the spot without damaging the surface. Take a paper towel, put it over the wax spot, and treat it with low temperature settings. Wax will stick to paper, and your desk is clean again. - Iron can even serve you as a hotplate. If there’s no other source of heat except for your iron and you need to heat up some water for tea or melt cheese for a sandwich, worry not. Secure your iron upside down so that it doesn’t move, set the highest temperature setting, take a heat-resistant cookware, and you’ll be able to boil water or even make eggs using your iron. Q: What safety rules should I follow when using my cordless iron? Don’t let children and disabled people use an iron without supervision. Q: How long should a charging base stay plugged in? A: Charging base supplies a cordless iron with electricity necessary to heat up an iron and produce steam. So it should be plugged in for as long as you are going to do the ironing. Being plugged in, the base will support set temperature when you put an appliance back. Q: Are cordless irons the same as portable ones? A: Cordless and portable irons are different appliances. Portable irons are supposed to be compact and lightweight. Plus, they often have a dual voltage option that allows you to take them to different countries. As for cordless irons, they are just the same as corded ones for home use. Their only difference is the lack of a cord that provides freedom of movement. At the same time, charging base makes cordless appliances bulkier so you’ll hardly want to take them with you. Q: Cordless sounds less powerful than corded. 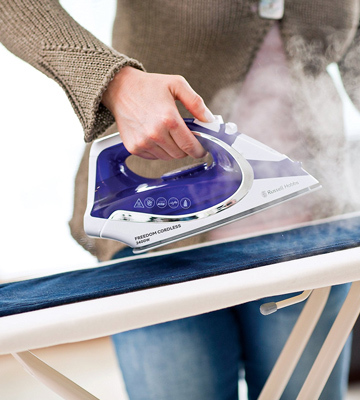 Won’t there be any problems with reaching high temperatures or continuous steam when an iron isn’t in the base? A: There is no need to worry about power or functionality of cordless irons. However, if power is your concern, choose a more powerful model and you will not be disappointed later on. Q: If I choose a cordless steam iron, does it mean that steam option will always be on? A: In the majority of modern steam irons, a steam function is optional. You can turn it on/off depending on your needs using a special switch on the handle. Some models also have a spray function that can be used instead of a steam option. Q: What are the main troubles I can face when using a cordless iron? You haven’t activated a steam option. Check all these points before taking your iron to the service centre. 1. Irons Buying Guide, Tesco. 2. 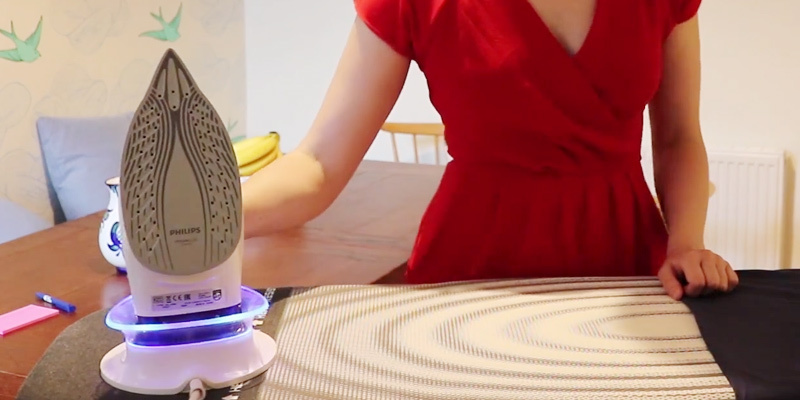 Christina Woodger How to Buy the Best Steam Iron, Which? 4. Kyle Schurman The Best Irons You Can Buy to Smooth Out Wrinkles, BUSINESS INSIDER. September 20, 2017. 5. Clothes Iron, Wikipedia. January 2, 2018. 6. Steam Iron Buying Guide, Consumer Reports. January 2017. 7. How to Buy the Best Steam Iron or Steam Generator Iron, Good Housekeeping. 8. Stephanie Mitchell How to Properly Use a Steam Iron, SFGate. 9. How Does a Cordless Iron Work? DoItYourself.com.